We did this hourlong drop-in event in conjunction with our Park District as part of the community ScreenBreak Week. 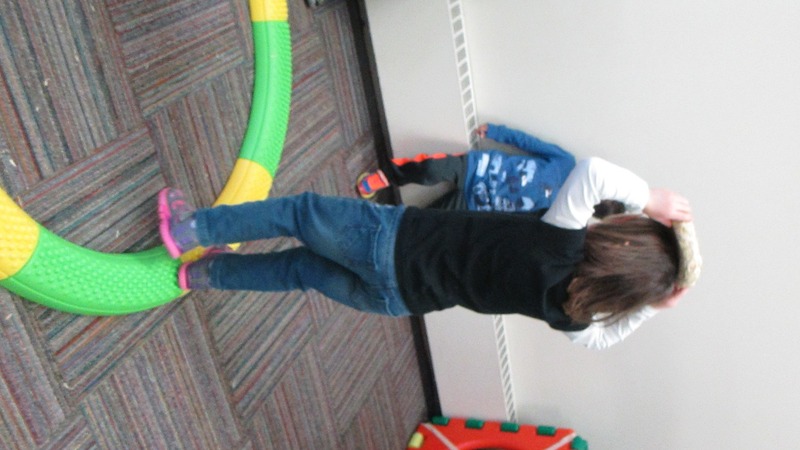 It was similar to last year’s Read Across America party, with stations set up around the room. Each station was related to an Elephant & Piggie title. We had about 70 participants, a mix of families and groups from the Park District’s after school program. Station 1: I Really Like Slop. This was pretty incredibly gross. The kids either loved it or hated it. I made the slop out of clear glue and liquid starch, with some liquid food coloring and plastic bugs thrown in for added grossness. I’m more used to making Flubber, which has a more exact recipe and is a little less gooey. This one needed periodic refreshing with the starch to keep it from getting too sticky. 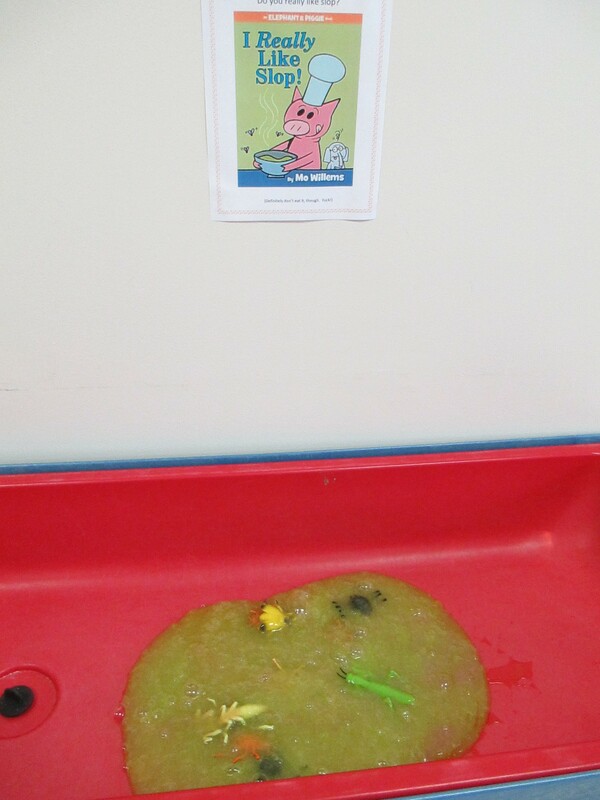 It actually looked and behaved quite a bit like mucus, which may have been much of the attraction for the elementary school aged boys, many of whom were sporting their own runny noses. Ick. Station 2: We Are in a Book. 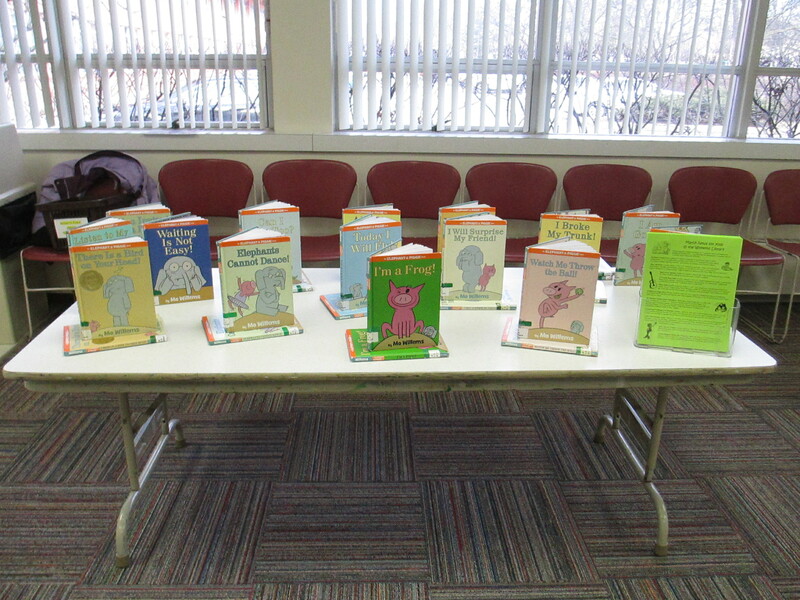 This one was really simple – just handouts printed out from the Elephant and Piggie Event Kit on Mo Willems’ website. 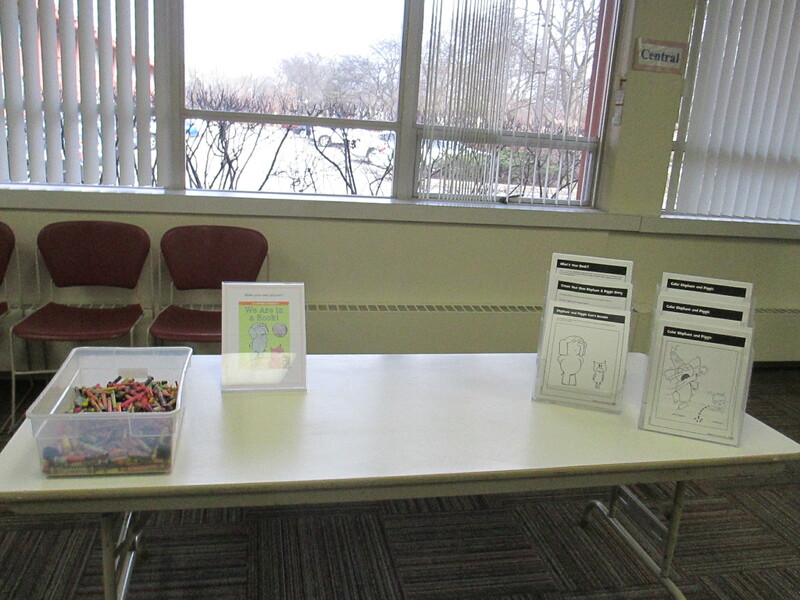 We had a few that were mostly coloring and a few that were more about writing / making up stories. Station 3: There is a Bird on Your Head! Walk on a straight or rounded balance beam while balancing a nest hat. This was a super cute activity, but we had a few logistical issues. 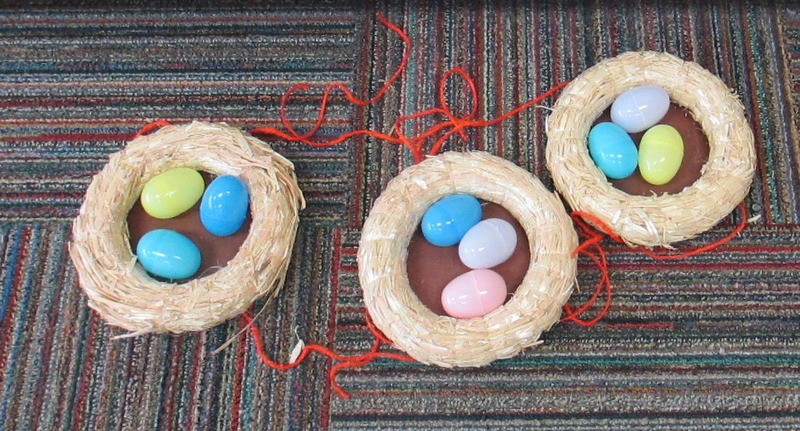 The Park District staff made the hats out of straw wreaths glued to a flat bottom with strings to tie them on. The bottoms were really slippery, and it was hard to tie the hats tight enough to keep the hats on the kids’ heads. We brought the plastic eggs, which had been in our closet for years. Apparently really old plastic likes to shatter when dropped on the floor, so the egg drops were perhaps a little more realistic than we intended. Some of the kids were horrified when their eggs broke, and others thought it was hilarious. Station 4: I Will Take a Nap! We made blankets out of flannel rectangles, with scrap flannel, scissors, and glue for decoration. 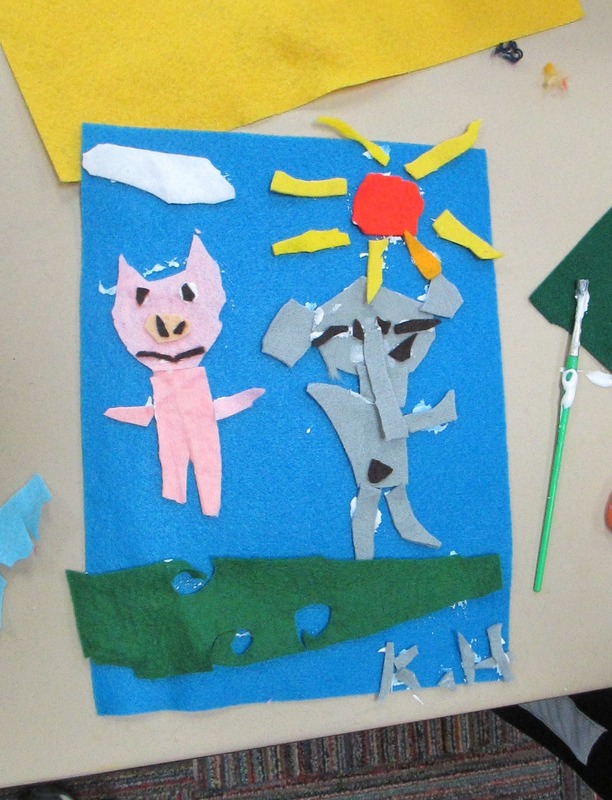 My favorite creation was this Elephant and Piggie blanket, made by a 9-year-old boy. I’d say this was the least crowded station, and some of the gluey blankets were left behind, but the kids who did it spent quite a long time with it and really seemed to enjoy it. Station 5: I Am a Frog! 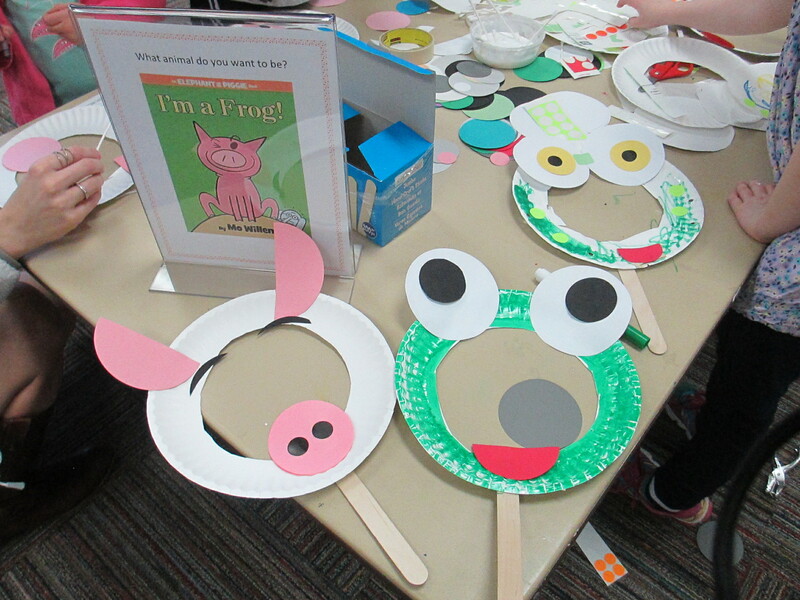 We put out paper plates, sticks, scrap paper, scissors, glue, tape, stickers, and markers so the kids could make animal masks. Station 6: Watch Me Throw the Ball! 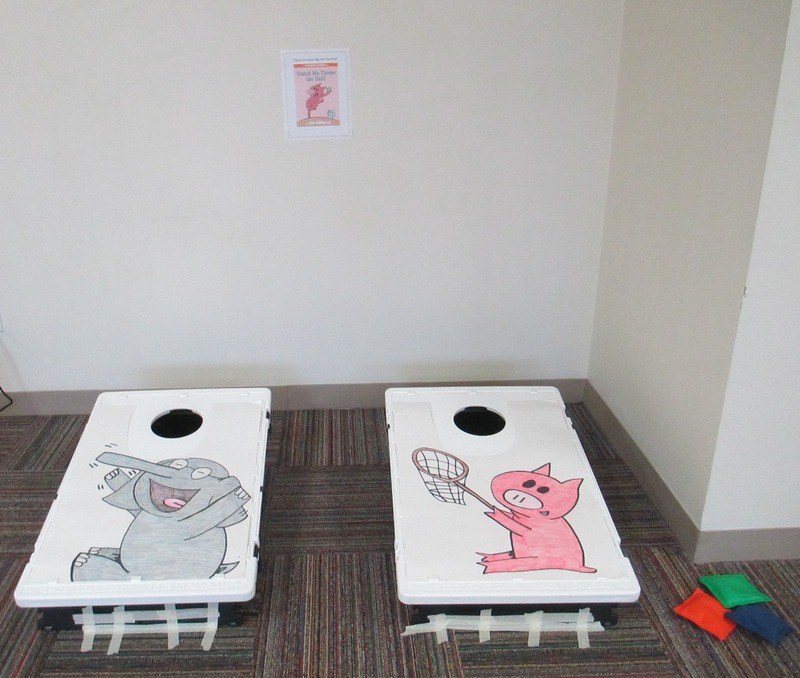 This was a standard bean bag toss game, and one of the Park District staff members decorated it for the Elephant and Piggie theme. Station 7: Listen to My Trumpet! 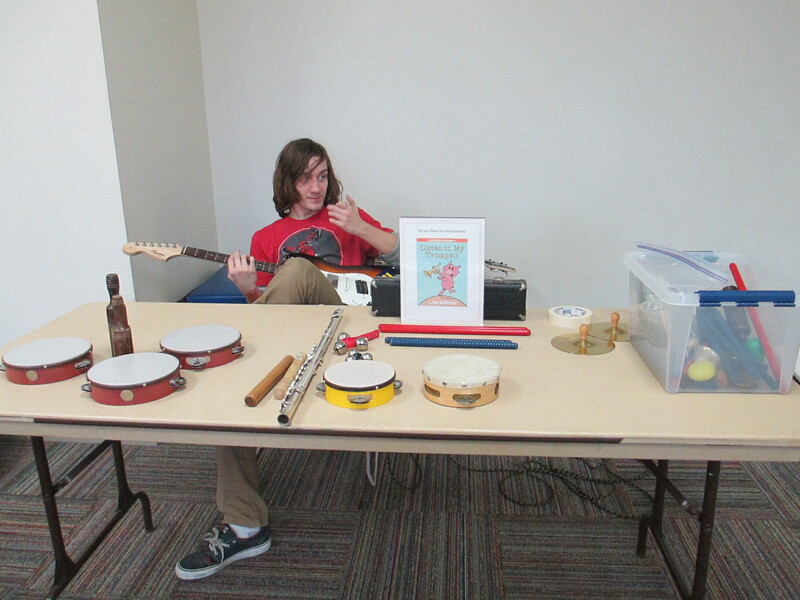 We set up an instrument petting zoo. It was mostly kids’ instruments from the library, but one of the Park District staff members brought in a flute. There was also a teen volunteer with an electric guitar who did an amazing job with the kids. He played quietly in the background, and then when kids came up, he let them play on his guitar. This got a little bit loud, especially when the room was full, but it was really fun. Station 8: Waiting is Not Easy! 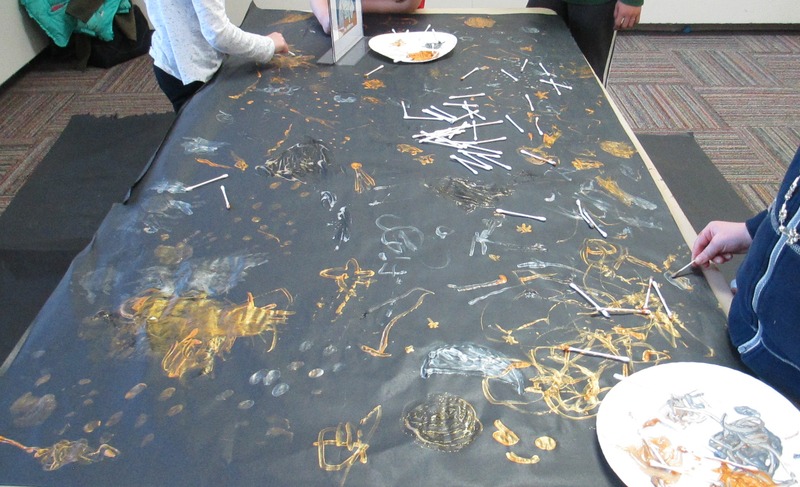 We put out black paper on the table along with gold, silver, yellow, and white paint and Q-tips and let the kids paint stars (or whatever they wanted) on the table. I expected this to be the least exciting station, but the kids actually had a really good time here, and many of them returned to it several times over the course of the program. Station 9: I Am Invited to a Party! This could just have been the theme for the whole event. The Park District painted this awesome signboard where the families could take their pictures. 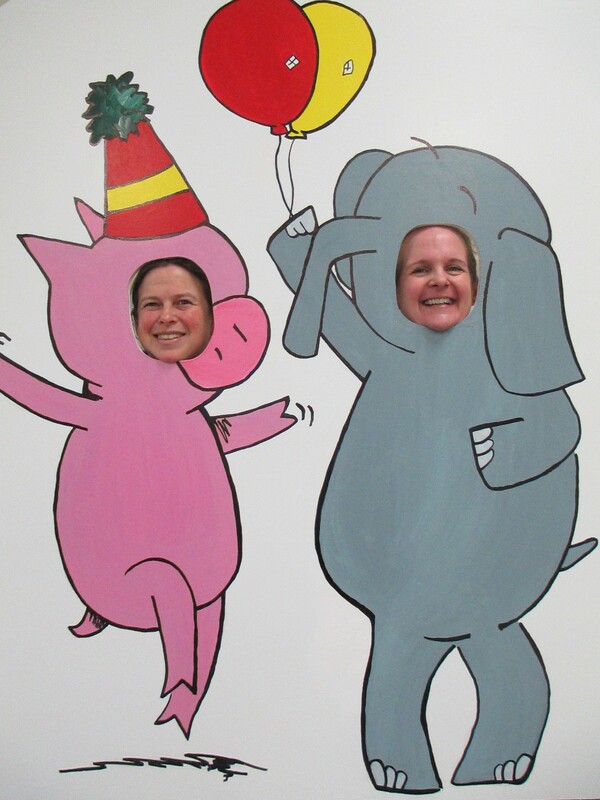 Last, but not least, we brought over a member of our Circulation staff to check out Elephant and Piggie books and issue new cards. He didn’t get a lot of business, but it was a nice service to offer, and we did register one new household. There were also a few families who came over to the table just to read books without checking them out. Hi Elisa! I miss you on facebook. Hope you’re having a good year. You should stop by for the official end-of-construction Open House on April 17.